Answer: The Moon’s not doing anything JR. It’s just hanging out there in space, and you’re passing it with the same speed you’re passing the telephone poles. Thing is, the distance between two telephone poles looks pretty small on the Moon compared to two poles near the road. This is a common illusion — I first noticed it sometime in middle school. When I asked my dad why it was happening he said (and I paraphrase) “It isn’t really following us. It just looks like that because it’s so far away.” Technically, his answer was correct. But it wasn’t until many years later that I understood why. You saw how the distant mountains moved the slowest. The trees were closer and moved faster. The telephone poles were closest and zipped by with the greatest speed. Of course, these are apparent speeds — you’re the thing that’s actually moving. My animation shows this illusion and, though the details may differ, it is geometrically equivalent to what you saw that night. VM / VT = DT / DM = 1 km / 384,400 km = 0.000003 times the speed of the trees. There’s no way you’d notice such a gradual motion with your eyes. Now if you were observing the Moon through a telescope and had a crater centered in your view, you’d see it moving to the right relative to the cross-hairs. The apparent motion would be very slow but it would be visible. So apparent speed is a measure of how fast something appears to be moving. In contrast, the relative speed of any fixed external object would be the negative (opposite) of your car’s speed. Relative speed is useful for understanding the changing positions of multiple objects moving at different speeds. For an example of this see my Jun 11, 2018 post: More Things Moving Backward. Here’s another way to look at apparent speed. If you draw a vertical line on the car window (below), you can watch how long that line takes to pass a distant object. To keep things simple, let’s say your car is moving at 1 kilometer per minute (37 mph). That means the line on your window needs to pass 1 km of telephone poles every minute, 1 km of trees every minute, 1 km of mountains every minute, and 1 km of Moon every minute. Because of perspective, 1 km looks smaller at greater distances. The 1 km vector for the trees and mountains are shown to approximate scale. 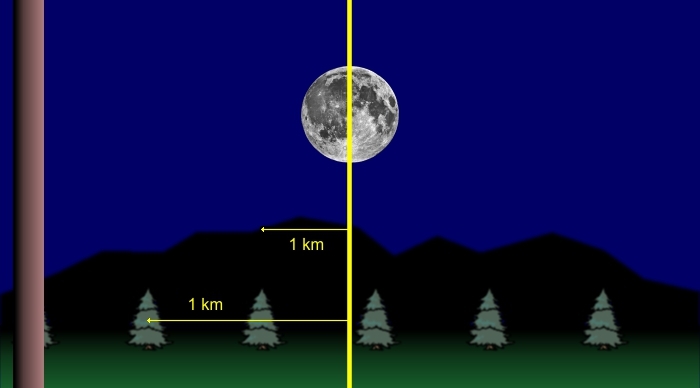 The 1 km vector for the (3475 km diameter) Moon is hidden in the thickness of the vertical line. If you’re a parent of a precocious kid who constantly asks “Why?”, do them the favor of providing an honest answer — even if it’s “I don’t know, let’s look it up.” That’s easy enough to do with online access, and it’s an opportunity for both of you to learn something new.